The Symbolic Butterflies have arrived! This cluster of butterflies spent the winter with a child named Mirna Fabiola in Saltillo, Mexico. Her school is directly on the monarch’s migration pathway! Mirna can see thousands of monarch butterflies flying overhead on their path back north. We also received a letter from Mirna’s teacher Ildefonso Guevara and another one of his students named Alan. They described how beautiful it is there in the sanctuary region with the mountains rising above them. Alan is 13 years old. He shared some of his life at home…. There are six people in Alan's family. His house is made of wood and there are three rooms in it.He told us that he helps care for the animals on his familes farm. .He also helps his mom cook. His mom cooks with corn, rice and vegetables. He told us that there is no transportation where he lives. He walks 5 miles to and from school each day.He said that this can be difficult. There are 25 students in his class. His favorite subjects are Geography and Biology. He said he would like to be a doctor when he grows up. What types of food does your family cook? Do you help care for them? What do you like to help your family with? How many students/children are in your class? 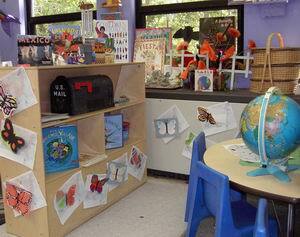 Check back soon to find out where OUR original butterflies landed! We’ll check online each day until we find them..
And the circle of friendship will continue…. 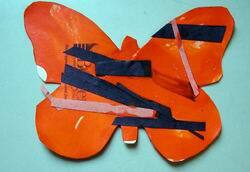 Click here to help find our butterflies. "A butterfly made by Devon has landed in Hannibal, Missouri and is living in Mr. Smith's 4th grade class at Eugene Field Elementary. The butterfly appears to have done quite well during its winter vacation in Mexico. A photo is attached for Devon." Visit Mr. Smih's (very cool) class online ! 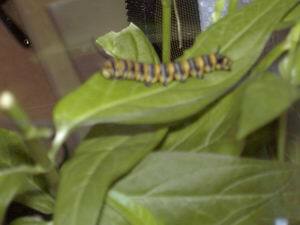 We have witnessed the amazing life cycle of Monarch butterflies right in our classroom! Mr. Jack documented it all on videotape. 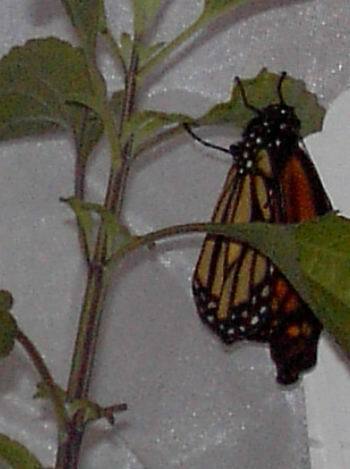 Read our story : "A Monarch Flies to Mexico." "We are selling cookies to send money to Mexico so they can plant trees for the Monarch Butterflies"
Our February 2005 Bake Sale raised $150.51 for the Monarch Butterfly Sanctuary Foundation. The children did a wonderful job of planning the sale,working on the advertisements and selling the donated treats! Thanks to everyone who helped and supported the sale. The Spring Butterfly Bake Sale made $120.00! Well done everyone!